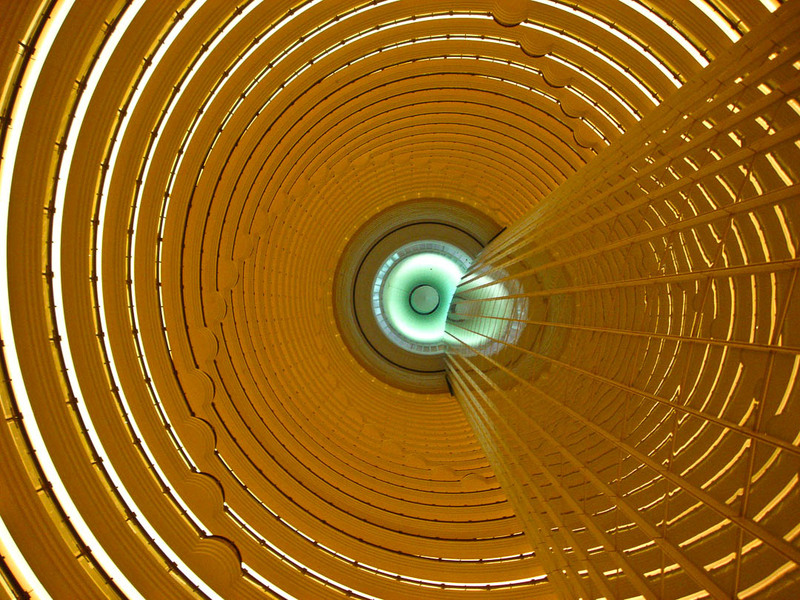 My entry for this weeks Cee’s Fun Foto Challenge: Looking Up at Things is a photo I took during a business trip to China back in 2013 inside the Grand Hyatt Hotel in Shanghai. The Hyatt is inside the Jin Mao Tower, one of my absolutely favorite skyscrapers on this planet. The architecture of this one of its kind. The barrel like atrium starts at the 56th floor and extends upwards to the 87th floor. Lined with 28 annular corridors and staircases arrayed in a spiral, it is 27 m in diameter with a clear height of approximately 115 m.
Jin Mao Tower itself has 93 floors and a height of 420.5 metres (1,380 feet). At the time of opening the Grand Hyatt was the highest hotel in the world. Genial! Wie aus einem Science Fiction Film!!! Chinese Si-Fi 😉 thanks ! Marcus, this is a stunning photograph! It creates a feeling of motion. Gives me a but if virtigo looking at it – love it! Enjoy you home time and weekend! Wow! Fantastic location and pic! Wishing you a good weeken to.